Property 28: Beautiful detached cottage- Peak District, Derbyshire. Dog-friendly! Family Friendly Bungalow, in the heart of the Peak District! Property 37: Family Friendly Bungalow, in the heart of the Peak District! Property 44: Lovely Cottage, Village Location, Near Holmfirth, Yorkshire, Ideal For Families. Spring Wood Cottage - cosy yet luxurious - sleeps 16 with hot tub spa room! Property 48: Spring Wood Cottage - cosy yet luxurious - sleeps 16 with hot tub spa room! We absolutely loved Eastholme Cottage! We truly loved our visit to Holmfirth and Eastholme Cottage. Sue was delightful as were the people of Holmfirth. The cottage was clean and Sue was very accommodating and hospitable. The views and outdoor space at the cottage were amazing! The English Garden in the backyard was such a treat to enjoy as we sat out on the patio and ate our meals. 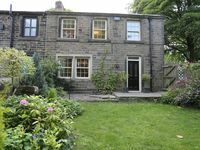 The cottage is within walking distance of all the charm Holmfirth has to offer as well as the beautiful nature walks in the meadows. We rented a car and drove to surrounding towns and were always so excited to come back to our little cottage. Truly a magical spot.